Never has the lovely Magda Schneider been more fascinating than in "Winternachtstraum" ("Winter Night's Dream”). As the orphaned shipping clerk of a big radio store in a South German city, who is taken for a New Year's trip to Garmisch Partenkirchen by the elderly head cashier as a reward for her daughter-like attentions, Magda is the animated center of the picture from start to finish. Her hero, the likely Wolf Albach Retty disguised as a teacher of skiing, also does excellent work and helps keep the action moving rapidly in a not too sentimental manner. 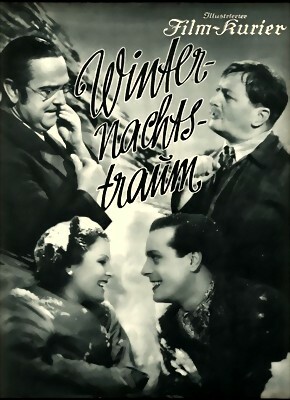 The regular comedy parts are entrusted to Richard Romanowsky as the kindly cashier and Hans Moser in the role of the porter of the establishment taken along at the cashier's expense. While Herr Romanowsky is practically perfect, Herr Moser is inclined to overact at times. There are high-class crooks, suspicious business men and busky mountaineers galore to complicate the funny situations. 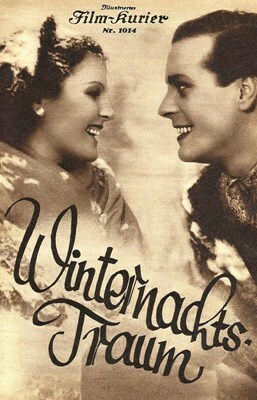 The scenes at the famous Winter resort, including Magda's adventures in the snow, are delightful. And the occasional musical numbers are catchy. There is hardly a dull moment in the whole film.